We’ve managed to keep our church property fairly rustic. We like it that way — the land is yours to enjoy and explore; we hope you’ll find time to visit our Prayer Path and Labyrinth. Its entrance is at the edge of the parking lot. The meandering Prayer Path was built largely by the children in our elementary Sunday School class. From time to time, they spend class time clearing the trail — and extending it as well — Ben says he learns from the kids every week they work. Pray or meditate as you walk, or just use it as a nature trail. If you’re new to prayer, or want some suggestions of ways to pray, pick up our Labyrinth Guide at the trail-head or ask one of us: we’ll be happy to offer direction. 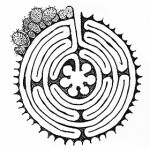 The prayer path comes to an end at an eleven-circuit circular Labyrinth — a Texas vernacular reinterpretation of the well-known design at Chartres — outlined in limestone found on site. Our labyrinth was designed and installed by church members during Lent and Eastertide of 2008. Because the path from the entrance to the center is the same path you’ll take coming back out again, it’s possible that while walking the circuits you’ll encounter another pilgrim coming toward you on the same path — no worries, just say a word of peace and step off toward the right, rejoining the path once you’ve passed. The path and labyrinth are available 24 hours a day; wear comfortable walking shoes. During the day, please pre-apply sunscreen, bring a hat and water bottle. If you get tired, note your location, break out of the path and sit for a bit on the bench, and resume later. Note: there are no rest room facilities out by the labyrinth; plan ahead. If you walk the path after sunset or before sunrise, we’d ask that you please take a flashlight with you and keep an eye out for cactus and for our animal friends (armadillos, raccoons, deer, etc.) — please be careful not to disturb them. Always feel free to replace stray rocks or tend to weeds as you move along the path. 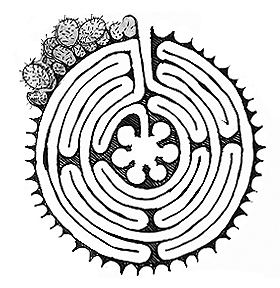 A labyrinth is a single path — unlike a maze, there are no intersections or choices to make. Start at the entrance and continue on the path as it winds toward the center, at whatever pace you’re most comfortable, giving space to any ahead of you.